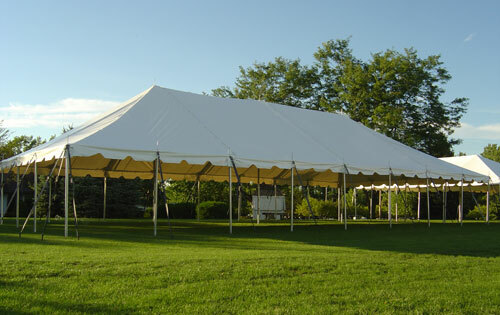 Whether you desire to use this tent for commercial or residential applications, it is guaranteed to do the job well. All the required stakes and ratchets are included with your purchase of the tent. The top is 95% heat sealed and is made from a tough 16 ounce vinyl and is equipped with bonded top panels that have 1 inch heat sealed overlapping seams. In addition, each pole is constructed from a highly durable galvanized steel and measure approximately 7 feet in length. * Please Note: * This tent will come with a white top. * Flame Certification: This item is NFPA-701 Flame Certified. Side curtain rope is securely held in with 1" polyesterwebbing sewn approximately every 12"
* Be the first to review this item!